The night of his eighteenth birthday, Clay Grant, exploited child star of 80's sitcom hit "Little Guy Mike", disappears after a mysterious fire destroys the Hollywood studio backlot. Chased by the media and haunted by his past, he's been on the run for fifteen years, until a fight with a determined photographer lands him in jail and ends his self-imposed exile. Just when the media is descending, motivational pastor Reagan Mitchell shows up in Clay's cell and offers him a deal to buy his freedom. Unsure if he can trust Reagan, but out of options, Clay arrives in majestic Cliff Falls under an overcast sky and quickly discovers no one escapes life. What happens when you run into everything you've been running from? In a world where entertainment has become our religion and religion our entertainment, Cliff Falls wrestles with the question of what does it mean to be truly human; comfortable in your own skin when everyone wants you to be someone or something else? What Clay discovers will change his life and perhaps yours. "Going over the falls will change you, but how it changes you changes everything." In the fall of 1996, C.B. 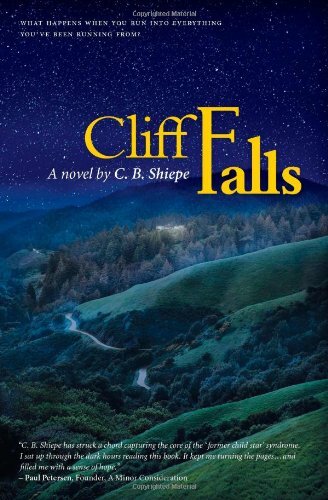 Shiepe went over the falls in his own life when a health challenge landed him in bed with little more to do than write. This story was part of that restoration and was years in the making. It took several incarnations, first a television pilot, then a screenplay, and finally, a novel. He doesn t plan on writing an opera, so hopefully the book did the job. With so much of life already on hold, the last thing he wanted to do was write a book, but he had a story to tell, and perseverance won out. Writing in coffee shops at 5:00 in the morning, he drew on his own experiences working in the entertainment and faith worlds. Looking back, he never asked himself if he could write a novel, a screenplay, or a television pilot. He just did and learned along the way, starting a publishing company to boot. Belief is a powerful thing. Born in Lawrence, Massachusetts, his family moved to sunny Southern California when he was four. A graduate of the University of Southern California, he began his career in production at the Walt Disney Company. He has consulted numerous churches nationwide, and co-created three ministries in Hawaii and California. He has coached entertainment executives and pastors on brand management, synergy, and visionary leadership. Founder and Creative Director of Cliff Falls Media, Inc., C. B. Shiepe continues to develop creative content that explores who we are and how we are connected to each other. Understanding that at one time or another we all go over the falls , he continues to write and speak to an intergenerational audience about the Cliff Falls experience. It's one thing to believe in something when you don t need it to be true. It's another when everything is riding on it. Above all, he thanks the One who has seen him through. "After you have suffered a little while, He Himself will restore you and make you strong, firm and steadfast." Whatever that looks like, he s game.